The INE-S900R provides a choice of views: full screen or main and side screens. The dual-screen mode gives the user two clear views with one look and is fully customisable. The user first decides what should be shown on the main screen, for example the basic navigation map, and then chooses from among many possibilities for the side screen, such as a second navigation view, information on each iPod song, incoming phone calls, clock, etc. Another appealing ONE LOOK NAVI innovation is the ability to switch the main screen and the side screen. For example, have the navigation map on the main screen while driving in the city, then on the motorway shift the music source to the main screen or bring up the iPod playback screen. Of course, an entirely different side screen can be selected at any time. The navigation system is only the beginning of what the INE-S900R offers. It keeps users entertained with a built-in DVD/CD player (MP3/DivX/WMA/AAC compatible), an AM/FM tuner, a USB connection for iPod, iPhone or USB sticks, and an AUX port on the front panel for enjoying both audio and video from portable media players. Users can also add Alpine options like an analogue or DVB-T TV tuner or even an advanced USB video interface, providing even more USB playback choices. Controlling all these sources is simple via the touch screen and the easy to use interface. The INE-S900R uses both a gyro sensor and a speed pulse feed to ensure accurate positioning at all times. Even with temporary loss of the GPS signal, such as in tunnels or near many high buildings, the system maintains high accuracy. Start-up is much quicker than other systems and route calculation is ultra fast: for example, for a 1600km route, calculation is done in under six seconds, as opposed to the common one minute for competitors. 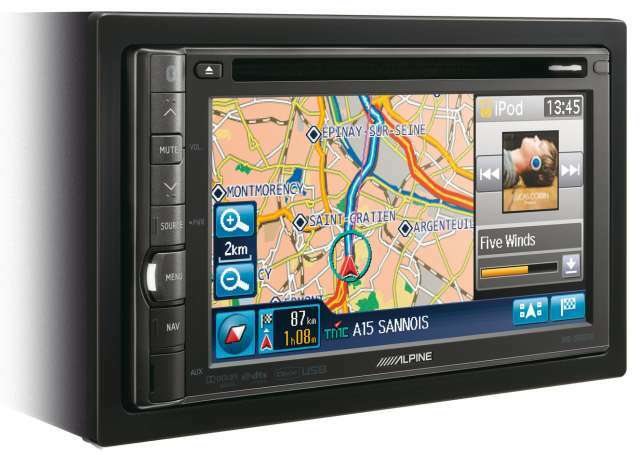 Best of all, Alpine's ONE LOOK NAVI interface provides a wealth of useful information at one look, with the main screen plus side screen offering many viewing and information options. It is possible to view two maps at the same time, for example, a zoomed-in view on the main screen and a low-zoom map on the side screen for a broader view. Other features include Advanced TMC, which lets drivers see useful information about traffic delays with one look and also lets them decide with one button to take a new route, Highway Mode, which provides detailed information such as upcoming rest stops, Personal POI Importing from Google Maps and POI websites, full route overview after calculation, and more. Alpine offers map software for 35 countries and route guidance in 18 languages. Alpine not only makes driving more pleasant and easier, but safer as well. The One Look Safety functions use the latest technology for safe driving. A built-in Bluetooth Module lets the driver safely handle phone calls without having to hold the phone. It is compatible with most of the latest Bluetooth-enabled mobile phones, including Apple iPhone 3GS, Nokia N97 and N95 8G, HTC Hero and Touch Diamond, Samsung S8000 Jet, and Sony Ericsson XPERIA X1, and many more. Users can see all of their contacts and make calls from the phonebook with one touch. For inputting numbers, a 10-key keypad pops up on the screen. When receiving a call, a special Bluetooth window automatically comes up on the side screen with the caller's name and buttons to accept or decline the call. The side screen does not overlap the navigation map or anything on the main screen as with other systems. Driving is both safer and easier thanks to support for Alpine's Rear Camera System HCE-107D, which lets the driver check the view when parking or doing any type of difficult manoeuvering. For even greater convenience, green, yellow and red pylons are superimposed on the screen to show how close the vehicle is to walls and other objects. The pylons are adjustable to match the vehicle. Further driving safety is available with a Multi-View Rear and Front Camera Kit. Alpine offers car-specific solutions for perfect integration of the INE-S900R into a great many vehicles. We have a variety of custom-sized trim panels to fit the differently sized and shaped dashboards of various manufacturers, and we will continue to bring out more integration kits, making it easy for customers to achieve a neat, attractive system. In addition, Alpine offers many interfaces for existing vehicle steering wheel remote controls and vehicle information displays for direct plug-and-play connection to see iPod playback information, caller ID/phone number, and so on. Customers can also access wallpapers and customise the background colour to match the dashboard illumination. For theft prevention, a security code can be set, which must be input if the unit is disconnected. Reception Sensitivity: -130 dB max. 10.000 Files / 1.000 Folders Max.